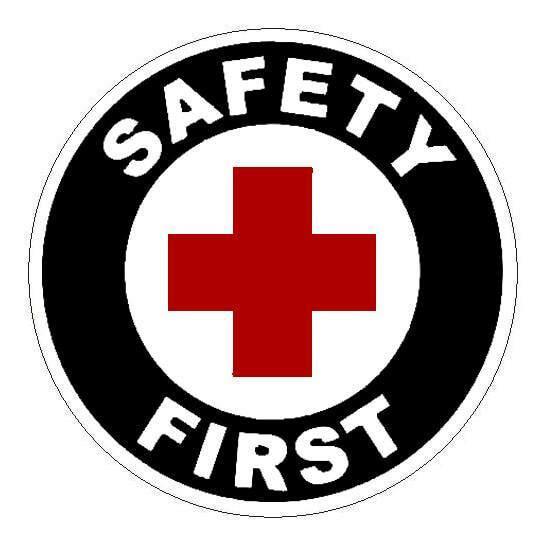 Safety above all else, has got to come first. We now have a crisis of safety, as cars go ignored. SAFETY has got to come FIRST when modifying our transportation systems with Complete Streets. One can not ignore the psychology of the citizens within the country where Complete Streets concepts are being considered. ​Every complete street looks different, according to its context, community preferences, the types of road users, and their needs. Governments all over the world have been racing to install measures and policy to help combat negative environmental impacts related to transportation. But in the process of trying to mitigate these environmental impacts by legislating measures to reduce carbon footprints, the basics of traffic engineering have largely been ignored in the last decade by advocates of alternative modes of travel and active transportation. 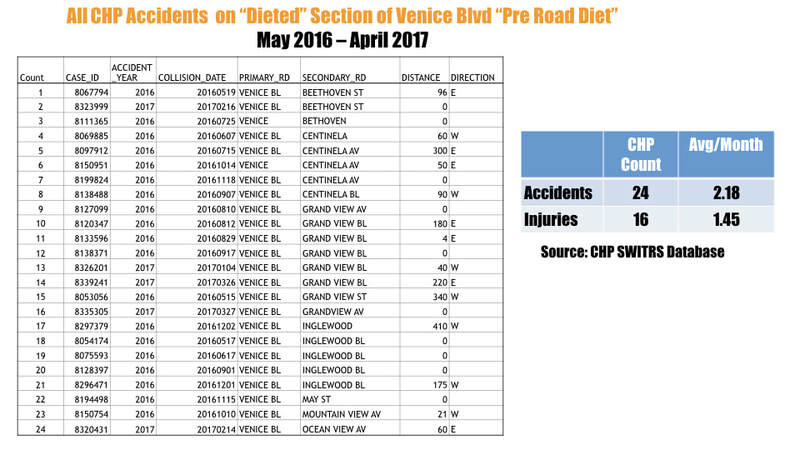 Not that these are not important, because they are (riding bikes and more people walking in an active lifestyle), but in the process of installing cookbook road diets and complete streets there has often been a throwing of vehicular traffic under the bus, literally. Taking away lanes on existing crowded roadways where LOS F currently exists is a mistake that leads to a kind of chaos where drivers are adjusting to significantly increased congestion conditions. Taking lanes away from cars to restripe and make room for bike lanes without regard to the very real impacts that this may have on capacity (depends on traffic volume being over capacity or not) can cause significant impact to the time and lives of the vast majority of people that use these roads, in a car. In some few cases where capacity has been taken away from a crowded road, essentially a social engineering experiment to see if people will get out of their cars (which has yet to actually work in the real world), this can lead to very real driver frustrations. As a result, drivers may try to game the system and there could likely be an impact to SAFETY, especially to pedestrians who have to compete with a disgruntled driver. As a Traffic Engineer interested in SAFETY FIRST, I advocate looking at solutions that make sense from a safety standpoint first, and then using common sense to consider driver psychology of a person behind the wheel of a car who has been significantly delayed. All it takes is a small percentage of drivers to wreak havoc in a transportation system, creating dangerous situations by speeding, ignoring signs/signals, etc. It has always been a small percentage of drivers that cause the 40,000 fatalities each year by speeding, texting, raging, inattention, or worse, impaired driving. It is not possible to directly fix this no matter how hard we try, as long as there are human drivers with a small subset that takes big and irresponsible risks while driving. We still have a constant of 40K fatalities each year in the USA, and it is precisely because we can't fix that demographic. This is an argument in favor of autonomous vehicles! When drivers get annoyed, they will generally take more risks to get through a traffic jam, and especially an artificially created road diet traffic jam by a local government, on a road that should not have been a candidate for a road diet. Drivers like this will, like they do on crowded freeways, make more lane changes to get ahead, make more trips to an adjacent cut through residential street and take it at higher speeds to get around the created traffic jam. Because of time constraints, there will be more, not less, drivers NOT yielding to a bicycle or a pedestrian at a crosswalk, or running that red light. It will become more competitive between cars and pedestrians. One can see this behavior rampant now in other countries, like I saw personally and up close in China (see video above), where the majority using the transportation systems are pedestrians, and the other 10-15% are drivers of cars... yet the car drivers there, by a wide margin, have the dominant "right of way" when there is no traffic signal with surveillance camera. Pedestrians must be careful even in crosswalks if there is no signal, because the drivers generally ignore these crossings and intimidate pedestrians by not slowing down. This can eventually happen here too, if transportation planners take punitive measures to make things more congested and miserable for car drivers, thinking it might get them out of their cars (not working according to latest stats!) by making their driving experience slower by design (less capacity resulting in LOS F), less efficient by design (longer signal waits), and generally unfair when compared to a very small percentage who bike and walk. 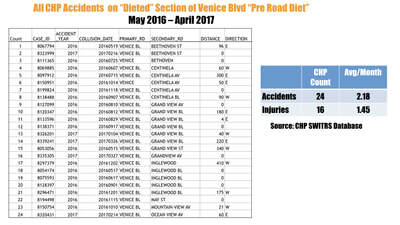 Its also not fair to the cyclists and pedestrians to give them the impression that they now have more right of way and perceived safety, when in fact we are seeing some cases of complete street installations actually having a negative community result like recently took place in the City of Los Angeles. See below. 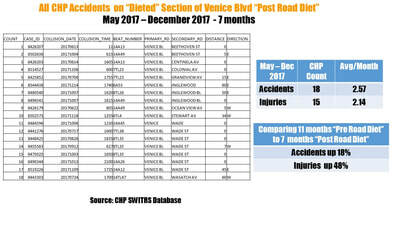 In the chart below as reported by the City's consultant Fehr and Peers on LA.STREETSBLOG.ORG, it can be seen that speeds INCREASED, which is the opposite intended result. Also travel times more than DOUBLED which is not a good outcome for drivers already frustrated with the changes. "Locals say they were told the project would improve safety, enhance the neighborhood and stimulate economic development. Instead, it’s snarling traffic, raising accident rates and destroying the village-like atmosphere that previously flourished along the boulevard between Beethoven and Inglewood." Collisions per 1 million vehicle mile traveled went UP from 3.00 pre-install to 3.22 post-install. Injury collisions per 1 million vehicle mile traveled went UP from 1.95 pre-install to 2.33 post-install. 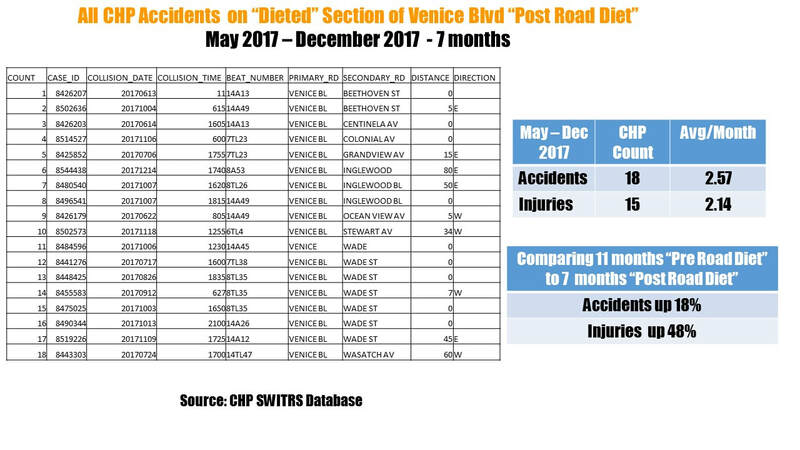 These numbers are in spite of the fact that the number of cars traveling Venice Boulevard has dropped substantially since the road diet reduced lanes by one-third, causing gridlock and forcing drivers to find alternate routes. Currently 31,000 vehicles a day travel the street, down from 37,000 a day per LADOT or down from 45,500 a day using CalTrans data. " What Happened Here? Why did the Complete Streets Road Diet Fail? SAFETY was not considered FIRST. Social Engineering was attempted, and there was no regard to an already LOS F condition for cars. Making LOS F twice as bad by taking away 50% of the lanes is not a good idea. Public Workshops were also said to be more of a formality than a real exchange of ideas and concerns, because there was no discussion with the public. ​ There are in reality, only a relatively few streets in existence today that can truly benefit from a Complete Streets Road Diet because most streets are already saturated with vehicles, this one was over capacity at 37,000 ADT and two lanes were removed! You can hardly fit 20,000 ADT on a two lane road, let alone 37,000! There is no other better place for them to go by doing this. It won't adjust correctly in the system. If you constrain a busy corridor so that it goes from 4 lanes to only 2 lanes for vehicles, you have cut the roadways capacity in half, and this has serious ramifications. This will cause drivers of vehicles to find alternative routes, and many of these alternative routes are going to be residential streets. The result is the volume of traffic on a road on a "Road Diet" is going to go DOWN... of course it will. Its going to go somewhere else, not disappear! And this will result in a loss of exposure to store fronts of merchants who relied on pass-by traffic. Venice Blvd traffic went down 30%, that's 30% less exposure. This leads to loss of sales, and it will lead to a loss of the business entirely in some cases where profit margins were tight to begin with. So we have these unintended impacts/consequences that seem to make things better for cyclists and peds, but worse for merchants and local residential streets. I say seem, because pedestrian fatalities in LA have nearly doubled in the last two years, not come down. 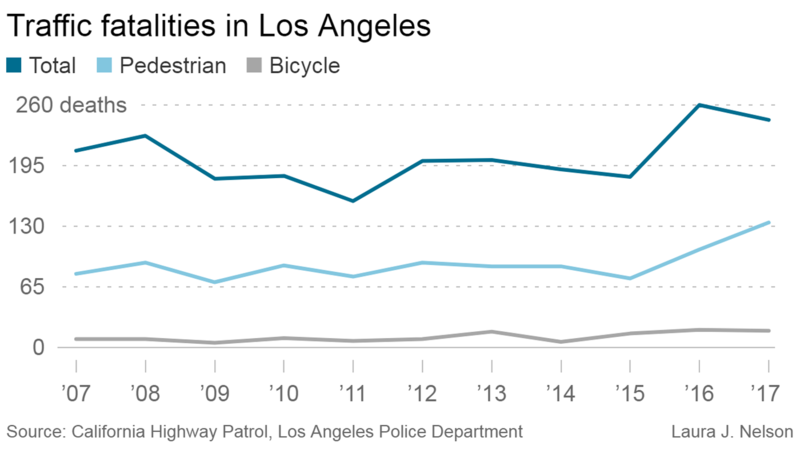 It is, by the numbers, NOT safer for pedestrians in LA. Some Road Diets on over-capacity streets are merely pushing the traffic to other streets, because the cars are not going to go away. In fact, in the USA, car ownership is still growing per household, up to 91% now from 87% in 1980. People have grown to RELY on their vehicles to get around, and this trend is growing not only in the USA, but in China too where car ownership is literally exploding (where it used to be only 10% of the population that owned a car, now it is jumping towards 20% and still growing, doubling their already congested traffic). This demand for CARS should not be ignored by transportation planners who have sought ideas to try and get people "out of their cars," but it has not been successful in doing that. This experiment has been taking place for about a decade now, and it is not changing the landscape overall. The opposite has been happening. In 1980, 87.% of American households owned one or more motor vehicles, and today this number is 91.3% indicating just the opposite effect desired by transportation planners is taking place! People are not abandoning their cars. They are not, overall, shifting to other modes. ​In nearly every city in the USA, the number of vehicles per household has INCREASED from 2015 to 2016. "Pedestrian deaths in Los Angeles have surged more than 80% in the first two years of a high-profile initiative launched by Mayor Eric Garcetti to eliminate traffic fatalities, new data show. In 2015, 74 people on foot were killed by drivers in Los Angeles. That figure rose to 134 in 2017, the highest number in more than 15 years. 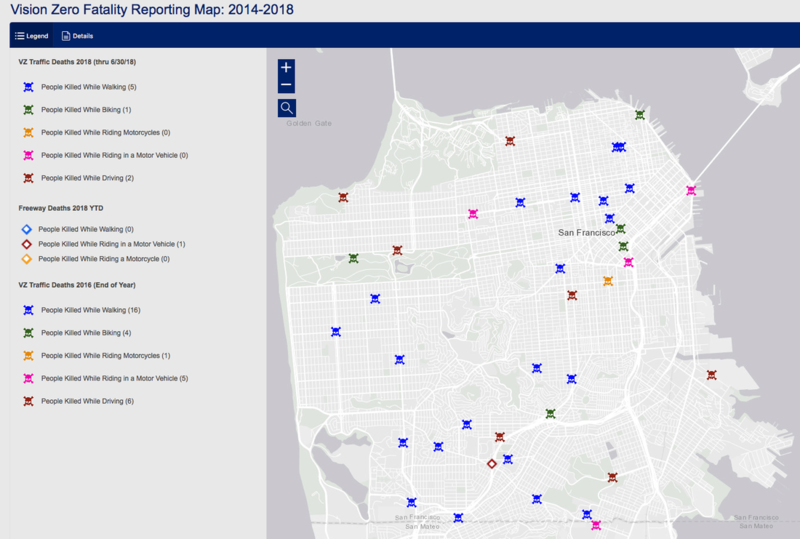 Overall, the number of bicyclists, pedestrians, motorcyclists and drivers killed in collisions on city streets fell last year by 6%, to 244, according to preliminary police data released by the city Transportation Department. It is obvious why ped fatalities are UP. It doesn't take a Traffic Engineer to figure this out. The reason why the number of pedestrians being killed by cars has increased (doubled!) in Los Angeles, is because citizens are being encouraged to walk more, but still in places where there are still cars moving at 45 mph, but now on a "Road Diet" and now driven by drivers even MORE in a hurry, because their travel times in the corridor have doubled as a result! The statistics in the United States indicate that there are more instances where a pedestrian can be killed by a vehicle (more pedestrians on the road now), and so it is happening. In China, they have 10 times as many fatalities as we do in the USA (400,000 killed each year versus USA at 40,000, but SAME number of cars on the road, similar miles of road too). Most of those killed in China are pedestrians, there are so many on the roads, and they are vulnerable to mortal danger with fast moving cars. Many transportation planners in the USA and elsewhere have been advocating for getting people out of their cars. The presentations have been colorful and informative, but in cases where public comments were not allowed, these have been contentious meetings. The safest place may be after all, IN one's car, where there is a seat belt, an air bag, and tons of steel protecting occupants from impacts. The statistics for Los Angeles speak for themselves. Pedestrian fatalities have nearly DOUBLED. It is time for transportation planners to give some pause as to whether their ideas have been working, or failing. Find out what is working, and accept what is not working. Truly have the smart growth we all want. PRISM Engineering advocates for common sense improvements to our transportation system. We need to consider the psychology of people, and consider their comments and opinions. We need to consider the culture as well, and what kind of result happens when solutions are more or less forced upon constituents who still need to get from point A to point B desiring as little delay as possible. Demographics in transportation in the USA are not like China, at all. It is very different when you have 85% of the people walking to and from transit, or just walking, and the other 15% use a car. The US population is only 1/4 of China's 1.3 Billion people, and the ratio of pedestrians to drivers of cars is so significantly different. They walk a lot in China, in the US not so much. Suburban and even urban suburban is the reason, things are more spread out here (excepting in very large China-like cities like SF, LA, Chicago, and NY). 90% of US citizens don't as a general rule, live in skyscraper saturated huge urban centers, so they rely more on cars to get around. Cities like Hong Kong have only 7% of their population who drive cars, and the rest walk, and some of these ride the transit systems. But their pedestrian fatality rate (12 fatalities per 100K vehicles) is 6 times that of the United States average! And two times that of Los Angeles (the city in the USA with the worst pedestrian fatality rate at 6 deaths per 100K vehicles). Why is Hong Kong so high in fatalities? Precisely because there are so MANY pedestrians, and the risk is so high. Only 7% drive, the rest cross streets to get where they are going, Someone is going to occasionally step in front of that car or truck or bus, or the driver won't pay attention, with a much greater frequency than happens in the USA. So we can plainly see this correlation, especially since the street systems in Hong Kong look very similar to those in San Francisco, with trolly cable cars, buses, taxis, and lots of pedestrians (although there are MANY more pedestrians per capita in Hong Kong than in San Francisco). This is what leads to the death rate being so high. Transportation Planners need to reconsider the idea that through modifying very busy roads with diets that they can achieve Vision Zero. We can see by stats that in the US people are not abandoning their cars. The trends in the last decade show an increase in US vehicle ownership, and in certain places where Complete Streets Road Diets have been installed on over-capacity road against the wishes of the local citizens, these have shown to increase pedestrian fatalities. This happened last year in Los Angeles. The facts are speaking. It's time to reconsider some of the approaches that have become so popular in this past decade. It is time to more appropriately apply Complete Streets. 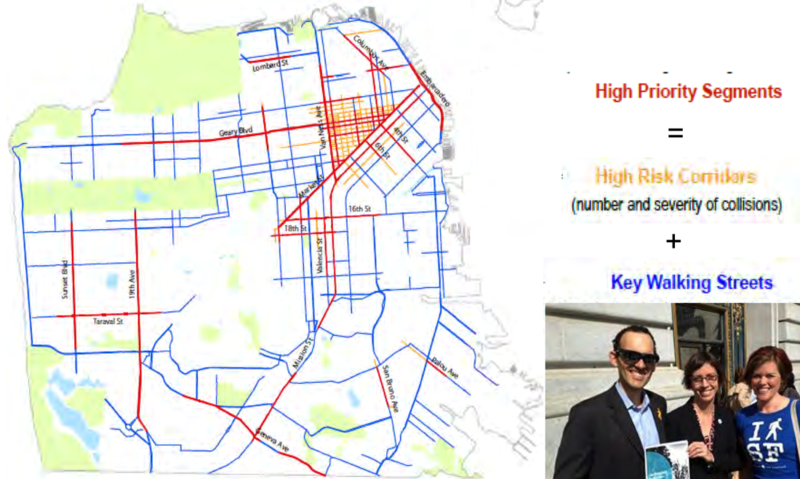 In the following maps from various SF City websites, we see where pedestrian fatalities are taking place (left map, blue X = PED Fatality), and we can correlate this with the map on the right which shows where Complete Streets Priority Segments have been identified and implemented... and those are the red lines, or high priority segments. Many of these fatalities are STILL taking place on roads that are the red lines (priority roads). It is logical to conclude, with this information, that the Complete Streets policies and decisions here have not been moving the needle of pedestrian fatalities in any significant way, as the accidents continue each year. Even the chart below shows that in 2017 SF had MORE pedestrian fatalities than they did in 2009. 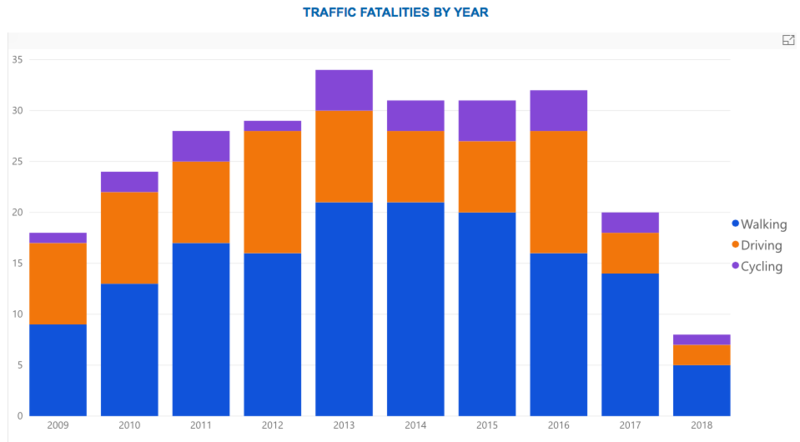 So far after a decade, this is not a trend that will achieve "Vision Zero" anytime soon, let alone by 2024 as per their goal... but it is showing that the needle did not move much either way for fatalities. In my view, putting a 2018 bar in this chart makes no sense along side the other bars that have a full year's data, because the 2018 bar is only a partial year representing maybe the first quarter or so. Including the 2018 bar "shapes" the curve of the chart as if 2018 was a banner year reduction in fatalities, when in fact, it is not. It might end up being two to three times taller at the end of the year, an entirely different picture. This chart does at first glance give the impression that accidents are WAY DOWN in 2018, which they are not. It is mix of apples and oranges, and maybe should have been projected as a full year using a different color. So What is the Solution to this? As a Traffic Engineer, don't "social engineer." The Engineer's job is to solve problems, but not be a politician in any way. As an engineer, a problem solver, again its not about setting policy, but to be analytic and creative with what data and constraints we have to work with in traffic engineering. From what I can observe from some of the policies and politics that have been implemented in the past decade, including modifying the Federal Government funding landscape, there has been somewhat of a blind eye turned towards funding sorely needed vehicle-related infrastructure improvements, while channeling federal dollars back to the states and their Metropolitan Planning Organizations (MPO) to be used for bike lanes and pedestrian safety improvements (in the Complete Streets category). In this process of shifting funding from benefitting the vast majority of users of our transportation system, to the much smaller demographic riding bikes and walking (which has brought about some good in equalizing the system, providing a much needed infrastructure for bikes and peds), it has created a safety void for drivers of cars (and pedestrians alike) and the levels of service have plummeted in the last decade. The result is an unintended negative consequence for all modes of travel. Most who drive are tired of long delays or gridlock, but don't see viable alternatives to using their car, and it is not necessarily their fault. Choices in most places are very limited, and not always safer. Road Diets on a busy corridor that is already over capacity, and then making it twice as bad by taking away 50% of its lanes, is a black eye to what would otherwise be seen as progress. Putting a Road Diet on a corridor that serves a major transportation demand and already at capacity is not a good fit. Better to think about parallel roadway facilities where bike lanes and pedestrians facilities can more safely be accommodated without impact to other modes, and without putting them on dangerous busy corridors with fast moving, sometimes impatient drivers. Lower volume streets are a great candidate for a Road Diet, because it will be SAFE. You do not want to mix pedestrians with high volumes of cars, bumper to bumper, and severely delayed from a Road Diet but anxious to move forward. Establishing the corridor as a lower volume street in the beginning before traffic builds up better PLANNING and more foresight, will help to prevent the kind of stressful environment where fatalities happen between cars and people! While most Americans want to bike more, 54 percent said that fear of getting hit by a car or truck holds them back. ​We need to plan on separating cars and bikes better...by more than just a stripe in the road. I have friends who are moving out of the Bay Area in Northern California, frustrated at what they call GRIDLOCK because they say they can't easily drive around without getting frustrated. Many of these are selling and moving to the hills where it is peaceful, quiet, and where policies have not made things unfairly worse for drivers of cars. 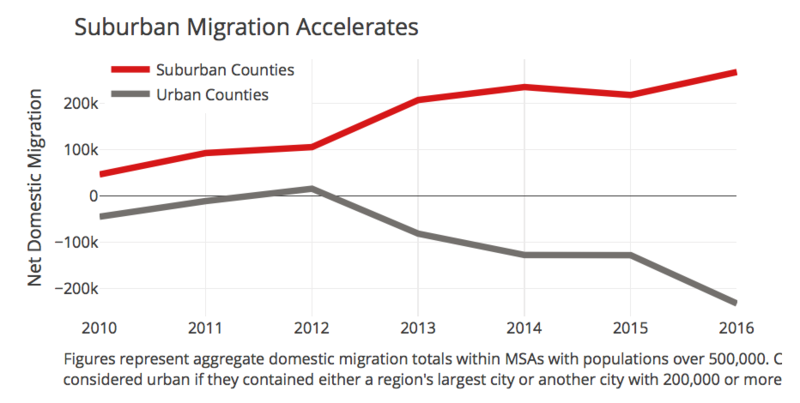 A suburban migration IS happening. Its where the new homes are. This graphic shows that in the USA people are electing to buy suburban places in much higher numbers. Transportation planners need to consider if current policies are having the desired effect, and how the masses affected have been reacting. Are people MOVING OUT of the dense urban cities because the GRIDLOCK is not tolerable? Are the delays high and aggravating, and yet stats show people are NOT giving up their cars to ride a bike overall in the US? The statistics seem to indicate this since there has been a growth in vehicle ownership, now up to 91% per house versus 87% a few decades ago. The bicycle demographic is a lifestyle, one that is a small percentage of the total, precisely because of suburbia and long trips from point A to point B. There ARE solutions that don't include trying to shift modes, get people out of their cars, etc., it involves better Traffic Engineering solutions to keep traffic moving, keep it safer, reduce interactions of pedestrians and bikes with high speed cars (more separations), and better transportation planning... putting homes and businesses where they belong, minimizing traffic impact with a better jobs/housing balance. Easier said than done. Safety First is the Key. When safety is the driving force, when Vision Zero is really taken seriously, then Engineers will be able to find the solutions that make people SAFE in the transportation system. This can be best done by eliminating the interaction of pedestrians with vehicles, as much as possible. We see what has happened when we INCREASE the number of pedestrians interacting with cars in cities with busy roads, the pedestrian fatality rate increases, like it doubled in Los Angeles recently. Hong Kong also has a 6 times higher pedestrian fatality rate than the USA because most of the participants in their transportation system, a street and sidewalk system similar to San Francisco, but Hong Kong has way more pedestrians on the roads (93% of their population). So what are the Safety First Solutions? AV CHANGE: ON STREET PARKING NO LONGER NEEDED. PASSENGERS ARE DROPPED OFF AND AV FINDS A SEPARATE AND APPROPRIATE PLACE TO PARK OR REPURPOSE (IF SHARED). STREETS ARE FREE FROM THE CLUTTER OF PARKED CARS, AND AV WILL PARK ON SIDE STREETS THAT CONNECT AV CORRIDORS WITH BIKE AND PED CORRIDORS, AND WHERE HOMES ARE.